One of the big benefits of running The Ski Blog is that we can ask some very cool and illustrious people to contribute. In the last few months we have been able to wangle posts from mountain bike guru Clive Andrews, regular ski tips from Chamonix's All Mountain Performance, and a review of K2's wildest off piste ski, the Pontoon, by Christian Shepherd and GB junior racer Sam Clissold. Now we are pleased to announce the collaboration of writer and broadcaster Melissa Love. Melissa is a ski season veteran and rose from the ranks of chalet girl to managing the whole chalet operation for a large UK tour operator. Maybe you are still pondering whether to escape to the mountains, but weighing up the pros against the cons. In which case Melissa's advice for all aspiring chalet hosts will be sure to help you make your decision. There are three questions every chalet host gets asked. Where did you learn to cook? Answer: Practising on the hapless guests who arrived in the first weeks of the season before Christmas, with Delia Smith in one hand and a large gin and tonic in the other. Would you like to go out for a drink on your night off? Answer: No, Bob-the-accountant-from-Kent, there are too many hot French ski instructors to work my way through and I only have one night a week to do it. When are you going to get a proper job? Aaah, my favourite and oft-repeated question, asked by friends and relatives, guests and simply the plain jealous, who find it hard to accept that working a season is anything more than a glorified holiday. I’d be lying if I denied there was an element of that, but as a five-winter veteran, I will happily assert that working a winter season is one of those experiences that equips you for much of what life will throw at you later on. For the unconvinced, I hereby offer up my five reasons why being a chalet host is a job for life, not just for winter. 1. You can keep a cool head in the face of any culinary disaster. My very first week of my very first season was Christmas – a time of high expectations at the best of times. Forgetting all about my Christmas pudding steaming merrily away on the hob, it soon boiled dry and burst into flames. A rugby-style pass of pan and pudding through the open window into a snowdrift soon extinguished it. A discreet retrieval, a liberal dousing with cheap brandy and the pudding was declared a triumph. No subsequent kitchen mishap has, or will ever, top the horror induced by the sight of that flaming pudding. 2. You can produce a veritable banquet for a mere pittance. Living within your means is an important life skill, and in the context of working a season, absolutely vital if you are going to be able to spend a disproportionate amount of your allotted funds on cheap wine. This is a calculation you will find invaluable at many stages of your life. 3. You can politely but firmly repel amorous advances from all-comers. There must be something about fresh air and exercise, or maybe it’s the high altitude which makes blokes on ski holidays think they are irresistible to you. Fuelled by cheap chalet wine and the misguided belief that they have become sun-bronzed ski gods after just three days in resort, there is always a week in the season which resembles a carry-on film, with the obligatory Benny Hill-style chase around the kitchen and lots of ‘accidental meetings’ in your favourite bar or mountain pit-stop. At home, it would probably be called stalking, but on holiday, you’re fair game and actually, you’d still really like to earn that tip at the end of the week. You quickly learn the benefit of remaining sober, flirting nicely and firmly locking your bedroom door. 4. You can turn in a creditable day’s work after only 2 hours of sleep and with the mother of all hangovers. Now, I’m not saying this is necessarily an important or particularly attractive talent, but it’s a good one to have up your sleeve. Later in life, you can simulate the experience of sleep deprivation and bleary drunkenness by having children, when the ability to drink a lot of wine (essential) and function on very little sleep (obligatory) is once more required of you. 5. You know the meaning of real job satisfaction. It’s true that not everyone thrives on late nights, vigorous exercise, excessive drinking and being at the beck and call of strangers, but for those who do and who are able to master the demands of a winter season, it is the beginning of a love affair. It’s not so much the Alpine atmosphere and the opportunity to date hot snowboarders that gets you, though that’s a bonus. It’s the knowledge that you have discovered what it means to truly love what you do and to do it well. In my book, that’s worth more money than any ‘proper’ job could pay you. Melissa Love is now married, mum of two and living in Sussex. Among other projects she is editor of the glossy Village Living - so there is life after ski seasons! If you would like to get more of Melissa's take on life take a look at her blog. Thanks Melissa! There are certain times in skiing history when there have been great leaps forward in ski technology. There was the move to clip in bindings, the introduction of the carving ski and now there is a new direction of innovation, towards fat skis. At the summit of this new direction in technology is K2, the American company, who are carving inroads into the new age of the powder ski. Sam Clissold, the 14 year old British team ski racer, recently purchased a pair of Brand new K2 Pontoons from the Blackside Store in Flaine and has had the perfect opportunity over the last two weeks to try them out in the deep powder fields of Flaine, France. At 160mm at their tip, 130mm under foot and 110mm at the tail, these are BIG skis. They have an inverse camber meaning that, when on piste, they only have about half of the ski that actually connects with the snow. They also have no turning radius, being the wrong shape, making it quite clear that these skis were made for one purpose, and one purpose only: to enjoy the off piste. “I can’t sink the tips,” says an exuberant Sam after our second run, “they just won’t go under”. From where I’m skiing behind him I can see what he means. Whereas I am fighting to stay afloat on a pair of “bit of everything” skis, Sam has no problem whatsoever. Throughout the day, Sam gets more and more relaxed as he becomes accustomed to how the ski works, by the end he is carving like the expert racer that he is, but the amazing thing is that he is doing so in snow that would reach up to his knees on other skis. Sam doesn't just ski straight down through the powder; he takes the odd detour to drop off a cliff. "You can tell he's 14" says one of our wistful older companions, as we watch from below while Sam takes an interesting path down, including a 6 foot drop, two jump shaped mounds and a natural slalom of trees. “I can barely feel the landings,” exclaims Sam. I guess that must be the work of the huge surface area, but for Sam it isn’t about why it works, it’s about how it works, and I can tell from his boyish grin, that they are working well. A couple of days later, he’s back out again shredding into a new dump of snow. We are the first to make it up to an untouched bowl and when we arrive at the bottom we take a moment to look back at what we skied. “Who ripped that up?” says one of us incredulously, pointing up to a set of striking tracks slightly to the right of where we all went. “That was Sam,” was the reply. No surprise there. Over the next few weeks the pontoons began to make more and more frequent appearances. Anytime Sam caught even the slightest whiff of fresh snow, he would take them out, and even if the snow was wind-swept, cut up, crusty, heavy or a combination of the above, he was still skiing it with ease. In fact, he skied it with more than ease; he was skiing it with enthusiasm, still pulling tricks and just having one hell of a good time. Today, after another morning of powder, I decided that Sam would have made up his mind about exactly what he thought of the skis, so I asked him. “What’s the verdict then?” He takes a moment to think while examining his skis and taking in the signature K2 graphics. “Overall,” he finally replies, “they are one sick pair of skis! 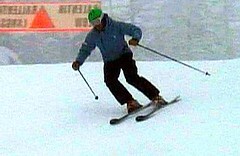 Carving is a form of ski turn that is non skiddy, ie using the shape of the skis and only two of the three steering elements (pressure, edging and not using rotation). If correctly applied, the skis will cut through the snow smoothly tracking around an arc. 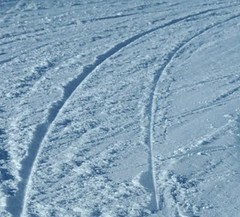 Start skiing in a straight line on a suitably flattish piste with your feet at hip width apart. 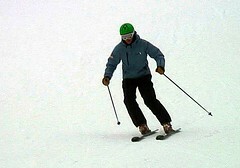 Without turning your feet, tilt both your skis in the direction you wish to turn. 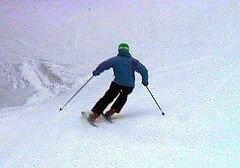 At the same time stretch your outside leg to push the ski against the snow. Feel the skis grip and allow time for the skis to start carving. How to hold the carve: Resist the desire to rotate your legs and feet. let the pressure build up. As the pressure increases in the arc, you can increase the amount of edge tilt to tighten the carve. How to finish the turn: When you feel the turn is complete, simply release the pressure built up in the turn by softening the outside leg, this will allow the feet to come naturally back underneath the body. 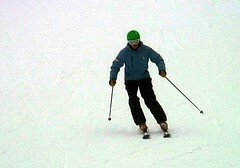 How to transfer to the initiation of the next turn: With a stretch down into the snow of the new outside leg, resist the new temptation to turn your feet and skis, using the tilting motion and stretch of the leg to create more pressure on the outside ski – so repeating the process used in the turn before. Linking clean carving turns is a great sensation, it's fast but feels stable. We hope you enjoy the tips. Glacier Skiing Safety (full audio version) from Simon Christy on Vimeo. The legendary Vallee Blanche in Chamonix attracts thousands of skiers every year. Starting high up in the Mont Blanc massif, with it's famous entry point at the top of Aiguille du Midi lift station, this famous off piste run is a mecca for strong intermediate and expert skiers. It is a 20km run which takes you through the largest glaciated domain in the Alps with a vertical descent of 2700m. It is a real opportunity to experience a high mountain environment away from the crowds, and one of those truly once in a lifetime experiences. Glacier skiing is not without risk however. Chamonix-based mountain guide, Andy Perkins, and ski instructor, Simon Christy, have put together a 6 minute video aiming to inform skiers and snowboarders of the basic principles and what to remember when skiing on glaciers. The video was filmed last winter on the Vallee Blanche and produced with the co-operation of the Chamonix lift pass company, the Compagnie du Mont Blanc. The video is being screened all winter at the Aiguille du Midi and the Grands Montets. We think it's a great film, and we would like to urge anyone who is considering venturing into high mountain glacial terrain to book a local mountain guide - taking an expert with you is never a bad idea. Excellent ski conditions now available! Following wild, wet and windy weather across the Alps and Pyrenees over Christmas and New Year - with temperature swings from -10 to +10 in some areas - winter has well and truly returned. Lots of snowfall arrived for the turn of the year, with many resorts reporting 20cm plus of new snow over the first January weekend. Temperatures are now set to plummet, which will preserve the new snowfall and help maintain the good conditions for skiers and snowboarders. Weather forecasts are looking good too, with most areas due to receive some snow towards the end of the week and the rain-snow limit dropping to very low altitudes. The Netweather forecasts show snow coming in varying quantities across the board - from Andorra to Austria. If you're in a resort right now - and the snow is good - why not post up your own resort review on Chalets Direct, so that everyone at home can see how good it is. You can also post a photo and let everyone know how great the conditions are. Post your report on our Reviews section right now! Ok so you can ski. You can get down most runs, go pretty fast on the less steep runs and get through the off piste. Where do you go from here? Do you go faster? Do you look for jumps? Do you change your equipment? The world's best skiers and snowboarders can be seen out on the mountain in all types of conditions having fun. In the off piste they are effortlessly gliding rhythmically through the powder. On hard pack they are turning with great accuracy and rhythm seemingly dancing down the mountain. These boys and girls are out there having a great time because they have the technique and skill to enjoy the mountain. The mountain is their equivalent of a dance floor with their favourite music blasting in their ears. The more they do it the better they get, the more fun they are having, the more they are in harmony with both themselves and the mountain. They are buzzing. Nothing can quite replace the feeling. Very rarely will you find somebody who is good at a sport who has not had good and informative direction. The more direction you get the better you will become and the more you will enjoy the sensation of the sport. This is what makes a sport so addictive. You can guarantee Andy Murray loves the feeling of hitting a smooth clean backhand down the line. Bode Miller loves the sensation he gets from carving a beautiful clean turn down a GS course, Cristiano Ronaldo must love beating five players and putting the ball in the top corner. The common theme with all these guys is that they have great technique. There is no substitute for it. The better your technique the more fun you will have. 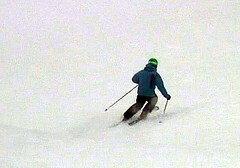 We often see intermediate skiers straight lining an easy piste at speed. They try to go faster and faster to generate some sort of buzz. This is ultimately boring and dangerous. A good skier/snowboarder will travel down that piste carving, experimenting, changing rhythm, getting more angle, working the skis as they are designed to be used. They will be having greater fun, getting fitter and go back for more. If you want to get that buzz and feel the rush then get some good instruction. Why try to reinvent the wheel? You only live once, do the best you can and do not miss out. See more offers on our Promotions page! Big snowfall forecast this week and excellent ski offers available for March and April! La Folie Douce comes to Avoriaz! Opening party 15th December! Backcountry Ski Holidays in Ste Foy - try it this winter! Try a ski holiday in La Tania! Verbier and the Swiss 4 Valleys - an Infinite Playground for summer and ski holidays!